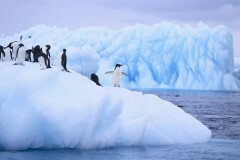 We will call you at your hotel in the morning to advise you of current conditions in Antarctica. If the weather is suitable for our flight, we will pick you up at your hotel by bus.At the Punta Arenas airport, we board our chartered jet for the 4¼ hour flight to Antarctica. Our route crosses the Drake Passage, then follows the west side of the Antarctic Peninsula and the spine of the Ellsworth Mountains. We land on a naturally occurring blue-ice runway on Union Glacier where you will take your first steps on Antarctica.Climb aboard one of our specially-adapted van for the 5 mi (8 km) shuttle to our main camp. Our friendly staff will provide a welcome tour of camp and show you to your tent. 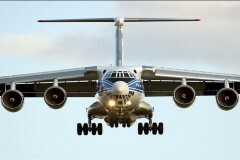 Once weather conditions permit, you will board our ski aircraft and head for the southernmost point on Earth! Your flight is planned to return the same day but we will bring food and camping equipment in the event weather conditions change and an overnight stay is necessary. Our guest services team will assist you in packing your sleeping bag. 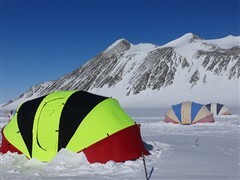 The flight to the Pole will take approximately 4-6 hours over the high, polar plateau. Below, you will see wind affected snow called sastrugi, crevasse fields, and an endless expanse of white.You’ll pass the Thiel Mountains approximately halfway to the Pole and continue to fly over the plateau. 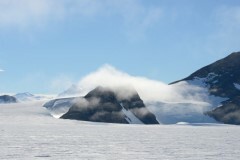 As you near 90° South, you will catch sight of the South Pole station, a cluster of buildings surrounded by snow and sky. 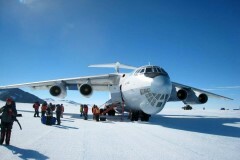 Our aircraft lands on a groomed ski-way and you’ll deplane near the South Pole marker. Here all 360 lines of longitude meet and beneath your feet the ice is almost 3000m thick! You have joined an exclusive group of people who have journeyed this far south on our planet. Congratulations! Be prepared for extreme cold and the effects of altitude as you disembark. South Pole temperatures range from -35° to -25°C and even the slightest breeze can quickly freeze exposed skin. Put on warm layers and cover your hands and face completely. The physiological altitude (how high it feels) at the South Pole is roughly 3300 m. You may feel the effects of altitude, including shortness of breath and mild headache. Take it slow and steady to help your body cope with these unfamiliar conditions. station at the South Pole, named Amundsen-Scott Station in memory of those intrepid explorers. 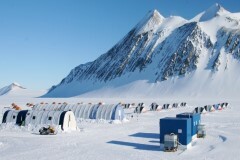 If time allows and the United States Antarctic Program (USAP) staff are available, you will be escorted inside the research station for a guided visit. Your visit to the Pole will last approximately 3-4 hours. Given the cold conditions and altitude, we’ve found this to be the perfect amount of time for guests to accomplish their objectives and enjoy the experience. Your return flight will take you back to Union Glacier Camp for a special celebration dinner and champagne toast to your achievement!